From what we can glean from Clinkle’s updated website, treats work kind of like a loyalty program, except the rewards go to other people. After seven swipes of your card, you earn a treat, which you then gift to another Clinkle user in the form of a personalized message accompanied by a cutesy photo. 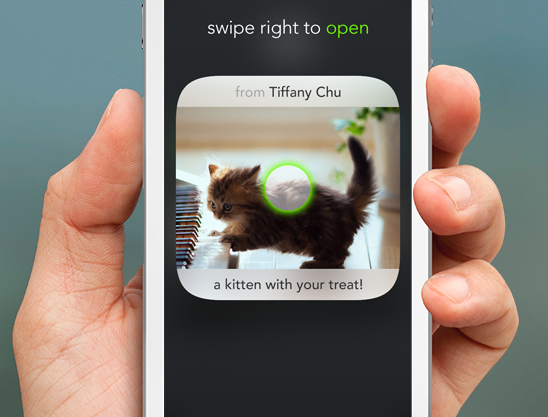 That user can collect that treat on their next card swipe. It appears that every treat doesn’t result in some kind of monetary reward or gift. Instead you “spin” the treat for a chance to get your purchase comped. If you don’t win, you still get to look at the adorable kitten photo your friend just sent you. Clinkle is also introducing peer-to-peer payments so Clinkle members can transfer money directly into each other accounts as well as spending management tools. The core premise is actually not a bad idea. Clinkle is building a rewards network into a social network, encouraging a close-knit community – in this case students at universities and colleges – to collectively participate in its payments service. It, however, bears no resemblance to the payments network CEO and founder Lucas Duplan originally spelled out when he launched the company last year with a $25 million seed round, big name Silicon Valley hires and celebrity investors. That network was supposed to use the college campus as a seedbed for a smartphone payment system that required no special hardware in the device or at the point of sale. The press has been sharpening their knives for months, waiting for this. They were bound to disappoint. Have to laugh at the VCs on this one. Hype doesn’t equal success. Clinkle sounds to convoluted to really draw traction with college students who are “too busy” with their regular lives to figure out the rewards program of this system. And this is for 25 million dollars of seed round? and after all the hype that they have generated? I guess the evolution to a full Wallet should be thought through with prevailing disparate banking systems across the globe. We have always been over-simplifying the realization of the Wallet and running into practical hurdles now and then. There will be a hybrid setup period when plastic money will co-exist with electronic wallet until there can be a full makeover – this is my personal opinion. Anyone who can come out with a roadmap and influence policies of organizations and regulators will surely do a lot of good – or perhaps like much of telecom, there is a need for an industry body with pan-global representation that helps. At-least that is the message we had got when two years back we assembled a set of speakers on this topic (Mobile Money) as part of my organization’s “i5 Talks” series.